Avocat au Barreau de Paris since 2010, Antonio Musella has significant experience in pre-litigation and litigation before French, European and institutional and ad hoc arbitration courts. He also has significant experience of contractual issues, international tenders and construction project management. 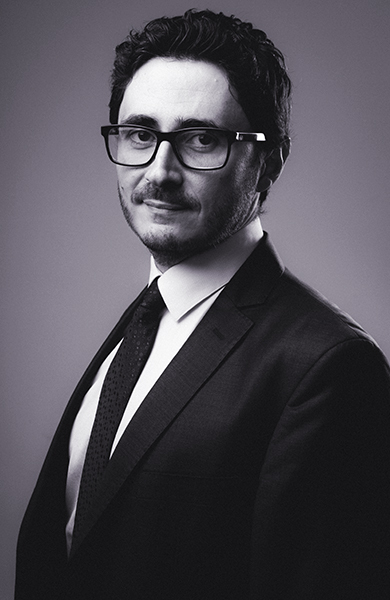 After obtaining a double degree from the Università di Firenze and the Université Paris 1 Panthéon-Sorbonne and before joining CastaldiPartners, Antonio Musella worked for three years at the Ecole de droit de la Sorbonne as a researcher. Since 2007 he has been a lecturer. In his work, Antonio Musella draws on his expertise in both the Italian and French legal systems, assisting companies in complex litigation and in the implementation of complicated projects. His working languages are French, English and Italian. Defending a French company in an ICC arbitration relating to the construction of a gas storage facility in Iran. Defending an Italian company in an ICC arbitration concerning litigation between partners in a joint venture in the renewable energy sector. Defending an Italian company in an ICC arbitration relating to the termination of a supply contract in the aeronautical sector. Defending an American trust in the exequatur in France of an arbitral award annulled by the Courts of the State of New York. Defending a consortium of construction companies in an ICC arbitration relating to the construction of an LNG terminal. Defending a construction company in litigation before the European Court of Justice concerning the enforceability of a jurisdiction clause in a contractual chain. Defending a consortium of construction companies in an ICC arbitration relating to the construction of a pipeline in Algeria (place: Paris; applicable law: Algerian; language: French). Defending a consortium of construction companies in proceedings to set aside an arbitral award before the Court of Appeal, the Conseil d’État and the Tribunal des Conflits. He regularly participates in meeting and conferences on matters relating to international law, arbitration law and contract law (Co-Chair Circle, Jean Monnet Module, Cyprus Arbitration & Mediation Chamber Annual Conference, Queen Mary University of London’s Centre for Commercial Law Studies, YAF). Frequent training and workshops with clients (Evidence and legal privilege in international arbitration; contract law reform; delay on construction sites; GDPR, etc.). Lecturer at the École de Droit de la Sorbonne (Paris 1) and the Université de Poitiers. Since 2010, Antonio has been the co-director of “Les brèves – Briefing” (International arbitration) in the Revue de Droit des affaires internationales / International Business Law Review, Sweet & Maxwell. L’essentiel du droit civil. Les obligations (1st, 2nd and 3rd issue), Studyrama. “La correzione”, in: Trattato di diritto dell’arbitrato, Vol. V – Il Lodo, Edizioni Scientifiche Italiane, 2018. “GAR Know how: Construction Arbitration: Italy”, Global Arbitration Review, http://globalarbitrationreview.com/jurisdiction/1000312/italy, 2016-2017. “National Chapter – Italy”, in: Enforcement of Investment Treaty Arbitration Awards, Globe Law and Business, 2015. “Article 33” and “Article 34”, in: The Chamber of Arbitration of Milan Rules. A Commentary, Juris, 2014. “La détermination de la loi applicable à la responsabilité des dirigeants sociaux”, in: Gazette du Palais, n° 95, 5 April 2013. “L’arbitrage et le droit de l’Union : une nouvelle étape en faveur du consommateur”, in: Cahiers de l’Arbitrage / Paris Journal of International Arbitration, Pedone, 2010, vol. 2. Antonio Musella has taught at the Université Paris 1 – Panthéon-Sorbonne since 2007, in particular contract law, civil liability law and private international law. He has taught Arbitration and alternative dispute resolution methods at the Université de Poitiers since 2013. Université Paris I Pantheon Sorbonne.